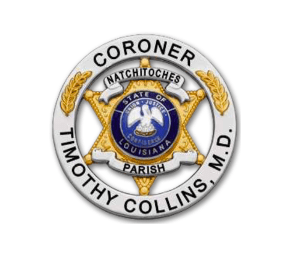 The Natchitoches Parish Coroner’s office investigated 1,061 cases in 2017 including 352 deaths investigations representing 720 hours of case work. That is according to the 2017 report prepared by Office of the Coroner, Timothy Collins MD. The office investigated 126 fewer cases than in 2016. The numbers were down in several categories including death investigations with 352 compared to 364 in 2016. There were 15 autopsies performed compared to 26 the previous year. There were 323 natural deaths reported last year and 305 in 2016. Of the 323 deaths, 64 were neurological in nature, four were genitourinary (relating to the genital and urinary organs), 90 were cardiac, nine were kidney, 48 were pulmonary, eight were liver, six were gastrointestinal, 75 were cancer and 15 were other causes. The office investigated six suicides, down from 10 the previous year. There were only two homicides last year and seven the previous year. Also down were the number of accidental deaths, 18, compared to 25 in 2016. There were seven fewer accidental deaths in 2017. They included three in wrecks, one from a fall, four from drugs and only three from other causes. There were no accidental deaths from drowning nor firearms. The office conducted 804 interdictions, which was up 44 from 2016. The office conducted 10 sexual assault exams, down two cases from the previous year. The office utilizes sexual assault nurse examiners for those exams. The coroner’s annual budget is $114,000. Of that, $75,000 comes from Natchitoches Regional Medical Center; $25,000 from the health unit; and $14,000 from Parish Government general fund.